*** What is Civet Coffee? You must have ever heard Luwak Coffee or Civet Coffee or Kopi Luwak. You also must have ever drunk it, otherwise try to drink it. 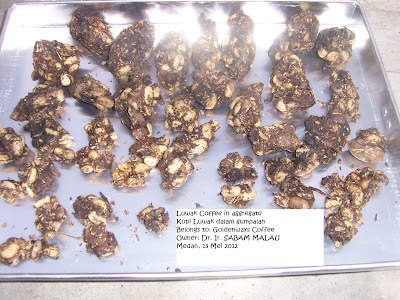 What is Kopi Luwak? Kopi Luwak is Indonesian word. Translation is Luwak Coffee or Civet Coffee. How is it produced? Animal called civet (Paradoxurus hermaphrodites) eat the red coffee fruits for fleshy part of fruit (mesocarp), and then swallow it. In the civet stomach, enzyme penetrate the coffee bean in order to make peptide shorter and to free amino acids. The shape of coffee bean is maintened. The coffee beans come out the civet stomach in form of compact aggregation, not in each bean separately. These aggregate will then be gathered by people, washed, dried under sunligt, hulled, roasted and made in form of powder (ground coffee). *** How do I provide my civet coffee? 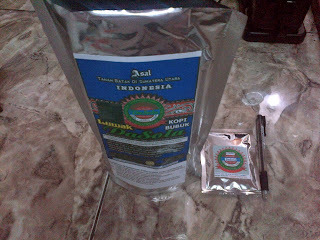 I buy compact aggregation from coffee farmers from Mountain Area (1000-2300 m above sea level) of North Sumatra Province, Indonesia. This way of buying can then ensure me that I receive pure (100%) civet coffee. 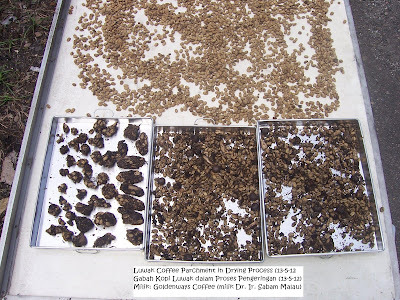 I buy the natural civet feces in form of compact aggregation I buy the dried natural wild civet feces aggregate (Natural Wild Civet Coffee) containing parchment of Arabica coffee from coffee farmers in the mountains (elevation 1000 to 2300 m above sea level) in the province of North Sumatra. By purchasing the aggregate, I can confirm that I receive a 100% pure civet coffee. Then I leave them to dry in the sun light on top of the aluminum plate. Once dry, then I wash it off with clean water to obtain parchment. Then I leave these parchment to dry in the sun light on top of the aluminum plate. Once dried, the parchment is then peeled manually to obtain green beans. The green beans are then washed to clean the seeds and to remove the husks. Clean green beans are then dried in the sun on top of the aluminium plate to obtain 12-14% moisture content. Next step, I do the Coffee Taste Test (Cupping Test) at my Coffee Taste Test Laboratory. Only the Kopi Luwak which is passed the Cupping Test will be sold to the buyer. Seen that the process is very long. Need to be notified that the yield of dried feces just 20%, meaning that 10 kg of dried feces gained 2 kg of green beans. *** What do I sell and What is the price? Green bean, rosted bean or powder will be put in plastic sealed @ 250 gram. Then it will be packed in Aluminum Foil. I am Dr. Sabam Malau, lecturer of Agriculture Faculty of University of HKBP Nommensen, Medan, Indonesia. Member of Theological Commission of Huria Kristen Batak Protestan (HKBP) Church. Doctor (PhD) from Georg-August University of Goettingen, Germany. Owner of Goldenways Coffee. Licensed Q Grader (Certificate issued by Coffee Quality Institute, USA, and SCAA, USA), Roaster, Agronomist, and Coffee Expert who has Cupping Laboratory. Chairman of NSCF-North Sumatra Coffee Forum. Member of Specialty Coffee Association of America (SCAA). Member of Specialty Coffee Association of Indonesia (SCAI). Coffee Consultant. Director of Center for Agriculture and Regional Development at HKBP Nommensen University. Member of Research Council of North Sumatera. Chairman of Agriculture Extension Commitee of Pakpak Bharat Regency, Indonesia. United States Agency for International Development (USAID) presented Certificate of Appreciation on 12 January 2011 for outstanding service to the USAID-AMARTA program in Indonesia, signed by CoP Dr. William Levine and Deputy CoP Mark Birnbaum. Awarded as Champion of the Community Entrepreneurship Challenge 2010, sponsored by Arthur Guinness Fund, organized by British Council Indonesia, signed by Mr. Keith Davies Country Director of British Council Indonesia; the fund in amount of IDR 100,000,000 has been transferred by BCI directly to account of Pakpak Bharat Proagribusiness Alliance. I really appreciate you all to have read this letter and to buy coffee from me, and disseminate this coffee information to your friends and networks. *** Why do I need to sell coffee? Most of the profit will be used to promote coffee and to increase sustainability of quality and quantity of coffee production through productive coffee value chain. Direct beneficieries will be 9,500 coffee farmers and processors while indirect beneficieries will be hundreds of coffee collectors, exporters, importers, and millions of coffee drinkers or coffee devotees or coffee lovers including you-perhaps. Science, Technology and Quality-Based Entrepreneurship. Pamper yourself, dear family, and respect guests to the right, true, fresh, tasty and healthy coffee. Seven Star Coffee, Affordable Price. Address: Jalan Karya Rakyat 33-A, Medan 20117, North Sumatra Province, Indonesia Telp (HP): +628126062016; PIN BlackBerry 28C72DDE; Email: drsabammalau@hotmail.com; Website: http://goldenwayscoffee.ecwid.com/simple-store, www.goldenwayscoffee.com; www.northsumateracoffeeforum. com; www. batakcoffee .com; www. - Minimum for eksport er 1 kg. Det vil bli sended gjennom Air Cargo. Kjøp 21 kg, så TOTAL frakt kostnaden er rundt US $ 325-425, og kjøpe mindre enn 2 kg da ​​shipping kostnaden er rundt 60-100 per kg som avhenger av landet. SENDE gjennom Air Cargo til ditt hjem på ditt land. Saya menjual Kopi Luwak dari Daerah Pegunungan di Provinsi Sumatera Utara. 100% murni luwak dari kopi Arabica. Tersedia: Batak Luwak. Hanya menjual kopi luwak alamiah yang diproduksi oleh luwak yang hidup liar/alamiah. Bukan kopi luwak yang diproduksi di kandang. Dikirim ke seluruh kota di Indonesia dan dunia. Photo 1. Kopi Luwak. Kualitas Bintang 7, Harga Terjangkau. Luwak Liar Alamiah. Arabica. Asal: Daerah Pegunungan Provinsi Sumatera Utara, Indonesia. Biji Hijau, Sangrai, Bubuk. Dikupas manual. Photo 2. Kopi Luwak PEABERRY. Kualitas Bintang 7, Harga Terjangkau. Luwak Liar Alamiah. Arabica. Asal: Daerah Pegunungan Provinsi Sumatera Utara, Indonesia. Biji Hijau, Sangrai, Bubuk. Dikupas manual. Photo 3. CIVET (LUWAK) COFFEE. 7 Star Quality, Affordabe Price. Wild Natural Civet. Arabica. Origin: Mountain Area of North Sumatra Province, Indonesia. Green Bean, Roasted, Ground. Manual Hulling. Photo 4. PEABERRY Civet (Luwak) Coffee. 7 Star Quality, Affordabe Price. Wild Natural Civet. Arabica. Origin: Mountain Area of North Sumatra Province, Indonesia. Green Bean, Roasted, Ground. Manual Hulling. 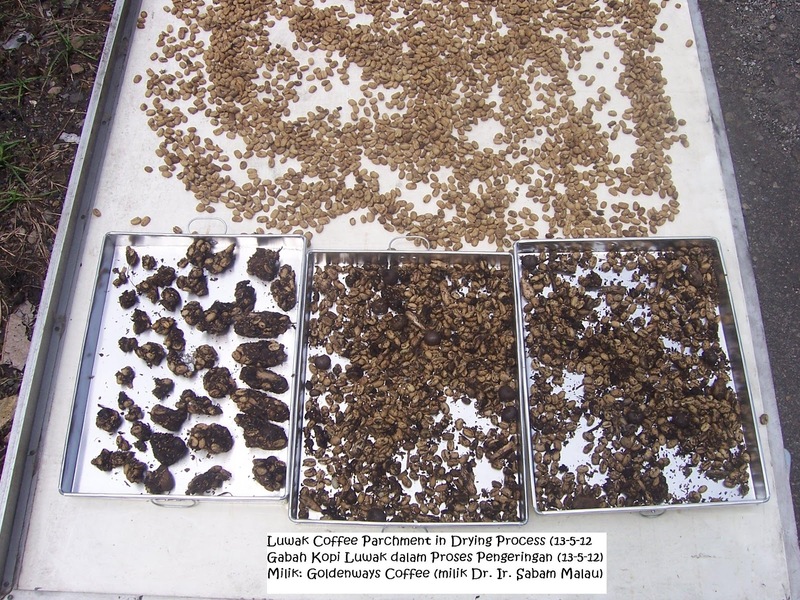 Posting terkait (Related Post), please Click Kopi Luwak PEABERRY (PEABERRY Civet Coffee).